I was invited to review Slim By Design by the publisher, and I received a free copy of the book. I was not compensated for my time, but this post does include an affiliate link, and I will receive a small commission if you purchase the book through Amazon. As always, all opinions are my own. Brian Wansink PhD, is the Director of Cornell’s Food and Brand Lab, and he has the coolest job in the world. Wansink and his team of researchers get to travel the world and go into peoples’ homes, workplaces, and basically anywhere food is served, and they watch what, when, and where and how people eat. They analyze what they see, how much people spend at restaurants, what’s in their grocery carts, and then, they make suggestions to change the eating environment to help individuals make better choices. I love that, because as a registered dietitian nutritionist, we focus a lot on why people eat, and what they eat, and sometimes usually that’s a challenge. Most people have a really hard time tackling the whys- too touchy-feely and emotional. And let’s not even start on the Eat-This –Not-That part of nutrition. I guess that’s why RDs have the Food Police reputation. Instead, Wansink approaches the overeating, mindless eating, less than healthy eating problem in a completely different way. He’s found out from his research, that there are changes we can all make in our food environment (like the layout, design and lighting of our kitchens, the place we choose to sit in a restaurant, the way we navigate the grocery store, and the layout of our workplace cafeterias and break rooms), that can actually have a huge impact on our diets. His advice is to take the emphasis off of ourselves, and let our environments do some of the work. Genius! In his new book Slim by Design: Mindless Eating Solutions for Everyday Life , he shares some of his research, and gives completely, mind-blowingly simple suggestions for proven ways to become slim by design. When you’re at a restaurant: Sit by the window, or near the front of the restaurant but not near a television. Window sitters order healthier foods. TV watchers order more fried foods. People who sit in the farthest from the front door eat the fewest salads. At work: Take a tray in the cafeteria line, and you’ll be more likely to grab a salad. Ask your employer to place a fruit bowl at the beginning of the line. When his researchers gave people a free piece of fruit first, they made healthier lunch choices. To encourage employees to pack a lunch, give the interrogation break room a makeover with happy colors, good lighting, plants, and clean counters and tables. Slim By Design is so full of simple, brilliant ideas and great information about how our environment influences how we eat. And just in case you’re on a budget, You won’t have to do any major kitchen reno work, because some of the suggestions are just so “Duh – why didn’t I think of that”, you can implement them on the spot. I love this book, and the author’s often funny and snarky writing style, and think it should be required reading for anyone who eats! Do you have a fruit bowl on your kitchen counter? 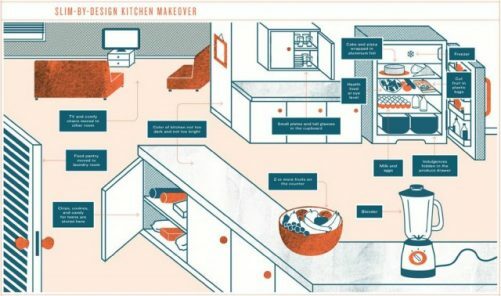 Have you ever made changes to make your kitchen Slim by Design? Love the idea of changing enviroments. It all matters. So true! Every little bit adds up 🙂 Thanks for visiting Diane! Sorry! I tried like heck to find a better image, but they were all so small. Maybe intentionally? The book is worth it for some great ideas!